Grease with some olive oil and flour a round 20cm cake pan. In another bowl, whisk the oil with the honey until well mixed. Add the eggs one by one and continue whisking. Add yoghurt and vanilla and whisk until all ingredients are just combined. Add the flour mixture to the liquid mixture and mix until just combined. 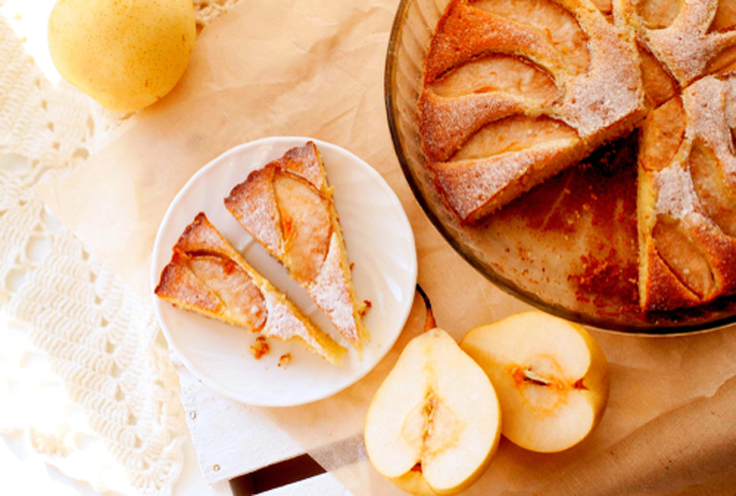 Pour the batter into the cake pan, arrange the pear slices on top and bake for 40-45 minutes, until it gets golden brown on top and a toothpick inserted in centre comes out clean. Leave to cool for 15 minutes before taking it out of the pan.